Took a pic off the plane. 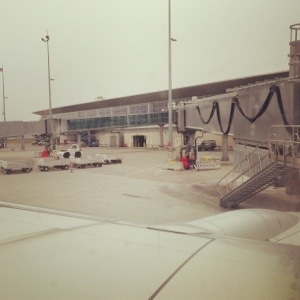 Airside at Winnipeg airport. A Winnipeger is allowed to speak of Winnipeg in whatever way one wants to. This song, “One Great City”, by Winnipeg band The Weakerthans, is literally a love/hate song of our mutual home town. 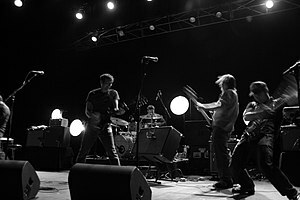 The band formed in 1997. They are an Alt band with some punk roots. This song is both melodic and ironic. It was on their 2003 album “Reconstruction”. A bit different that what I have featured lately, but, heard it on the drive today and had to post it. The Weekly Photo Challenge is titled Unique. We were driving around in Winnipeg, Manitoba and noticed this in the sky. 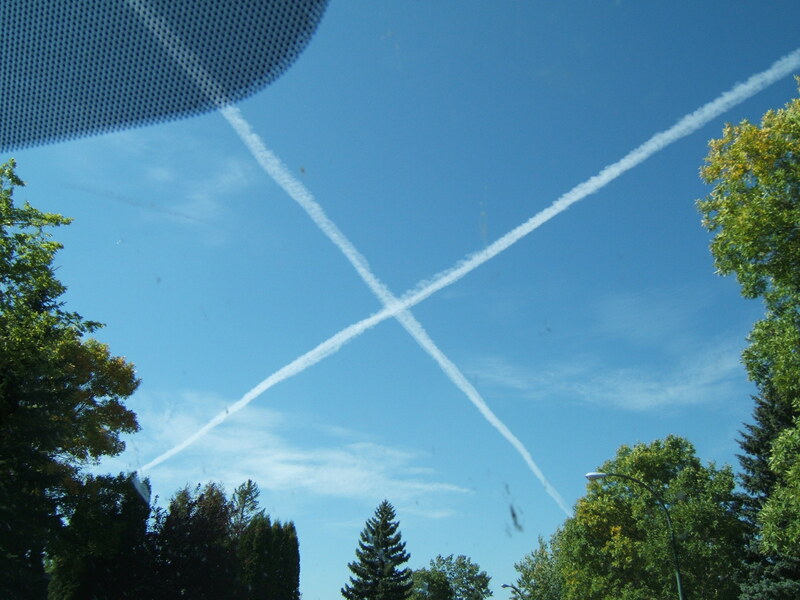 A perfect X formed by 2 contrails. Thought it was cool, and had never seen it before, at least this defined. Lori and I are born and raised Winnipeggers. We left in 1989, and look forward to our visits as most of our families still reside there. Lori had actually spent the whole month of September there as she had family matters to take care of. I joined her at the end of the month for a few days prior to embarking on our adventure to Ontario and Quebec. We had a great visit with our families which involved very little touring around. We did manage to squeeze in a few family dinners, both at home and in restaurants. Of course we managed to sneak in a few drinks as well. Thanks to all for providing us with some relaxing days and nights. Contrary to the proverb, of course you can go home again. 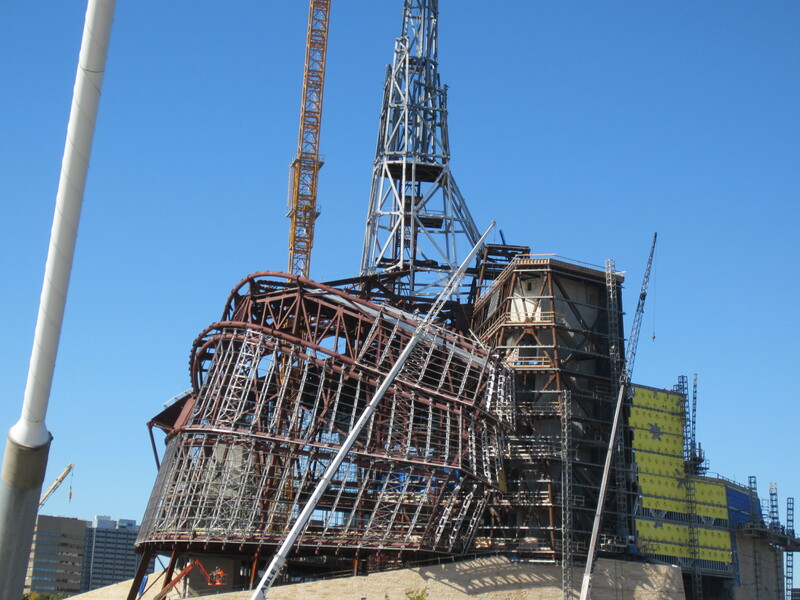 This is the Human Rights Museum being built at The Forks in downtown Winnipeg. A noble endeavour and some interesting architecture. I have always wondered about this. 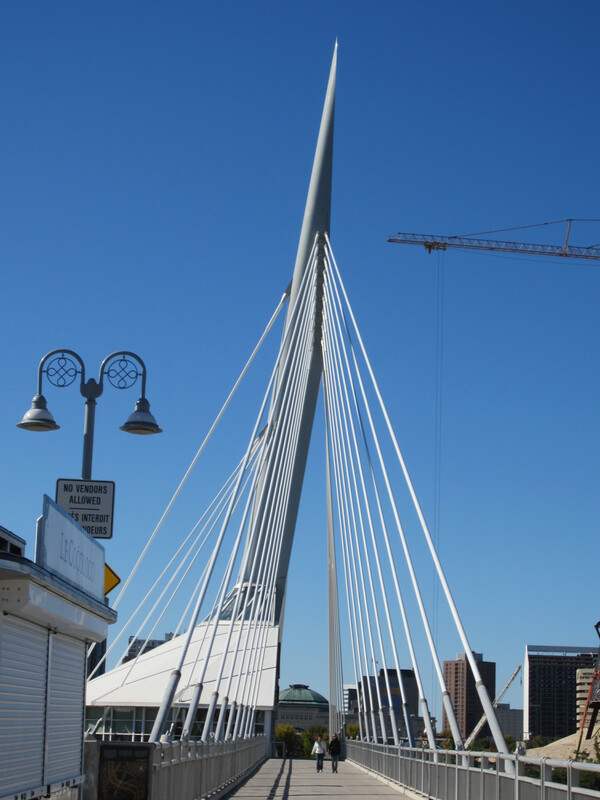 The city built a pedestrian bridge across the Red River, using what appears to be a phallic symbol to hold it up. An interesting choice for a centrepiece structure. The other thing I found strange was placing a restaurant in the middle of said bridge. I’m not sure what they were thinking, but why would they place this in the middle of a foot bridge in a city that sees 30 below on a regular basis. I can see people lining up to get in on an especially cold evening after walking a mile or so from where they parked their vehicle. Now for the food and drink. 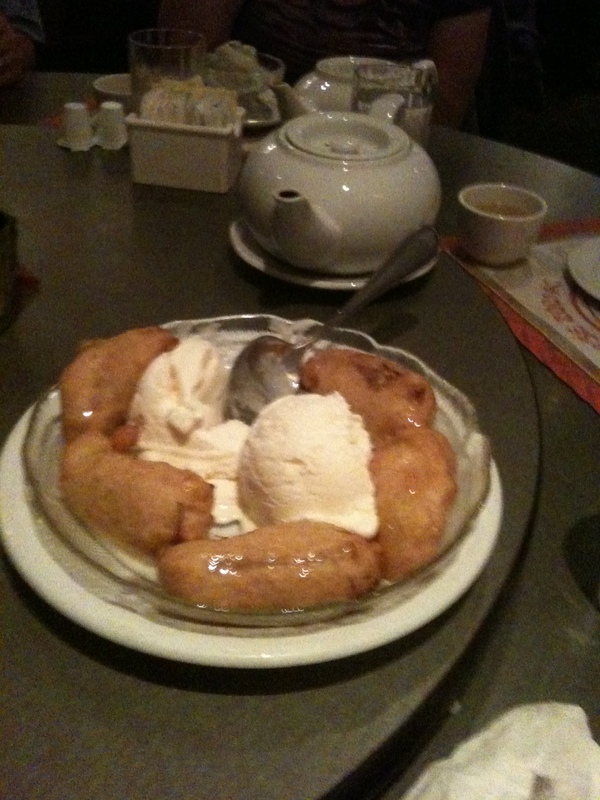 We had a great meal at Hungs Restaurant (excellent name that goes with the phallic theme) which we followed up with a dessert of deep fried bananas, with ice cream. 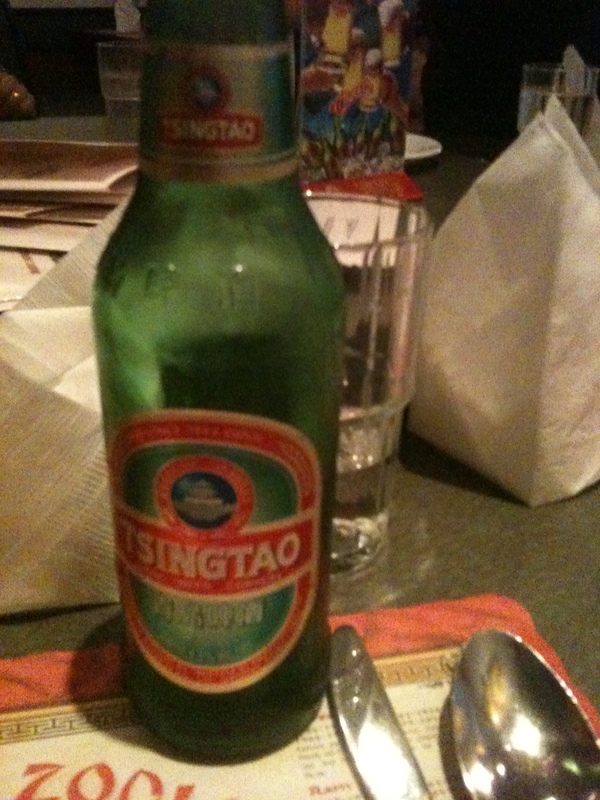 The entire meal was washed down with a few bottles of Tsingtao, a Chinese beer. 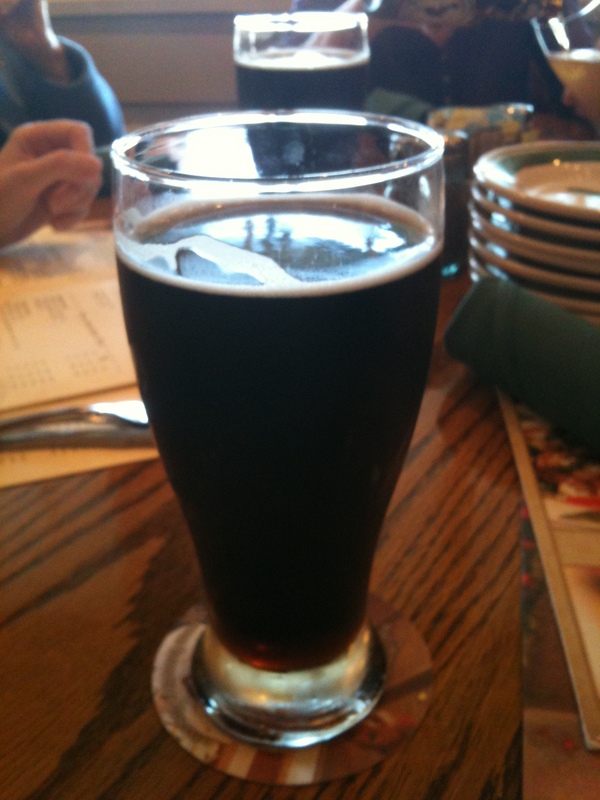 The local beer that I imbibed was Fort Garry Dark Ale. A great tasting beer, very smooth and rich. One of those beers that can only be savoured and not chugged. One, or maybe two should be enough for most before moving on to less rich varieties. As a final note, thanks to John and Cec for putting us up for the time we were there, and thanks to Gord and Cheryl for the large dinner party. It was great to see all again, hope to see you at Christmas. The draft is done, the team is named, the uniform and logo are being worked on. I would think that 95% of the world is happy that the Winnipeg Jets is the name chosen. A lot of history in that name and it would have been a shame to name them anything else..
Free Agent season opened on July 1 and the Jets did not exactly make a splash. Having said that, there really wasn’t anything there to make a splash with. Better to save the cash, see what you have in the fall and move towards next year with the youngsters already in the system. The goaltending is in good hands, the young defence is in great shape and signing a big name forward would have been a waste at this point. Lets face it, Brad Richards would have been an interesting pick up, but in reality, he would have added nothing to the team. One other point to make is that Winnipeg will not be playing in the East in 2012-13. The style of play in the West has some subtle differences, so it is a smart play to stay the course and work towards signing Western style players next year. The 2 signed so far are decent depth players, which we are lacking and in fact, of all the Canucks in the playoffs, Tanner Glass was one of the few who impressed me. Yes, his type of player is common, and yes, he will never be an all-star, but how many Canadian kids with heart do the Jets have at this point. He will do well on the 4th line and was cheap. Derek Meech is a solid AHL defenceman who is reaching the age where he could easily become a solid NHL player. He is also a hometown guy which is always a plus. He will make the team and will be a decent contributor. Of the guys that are left, Teemu Selane is an obvious choice. A link to the past could be a path to the future. Signing him is pretty much a no-brainer. Late Breaking, the Jets have just signed defenceman Randy Jones. He last played with Tampa Bay Lightning, but missed the playoffs with an ankle injury. Another solid, but not spectacular signing. A Jamie Langenbrunner or John Madden type of veteran would also be a reasonable pick up at this point as a veteran leader and bridge to the future, but only at the right price. My favourite place to eat in Winnipeg, the Paladin Restaurant on Des Meurons in St Boniface burnt yesterday morning. We made a stop here on every trip back to Winnipeg. Very sad, although I understand they will rebuild.